This morning we went shopping to hire some sleeping bags and down jackets for our trek. 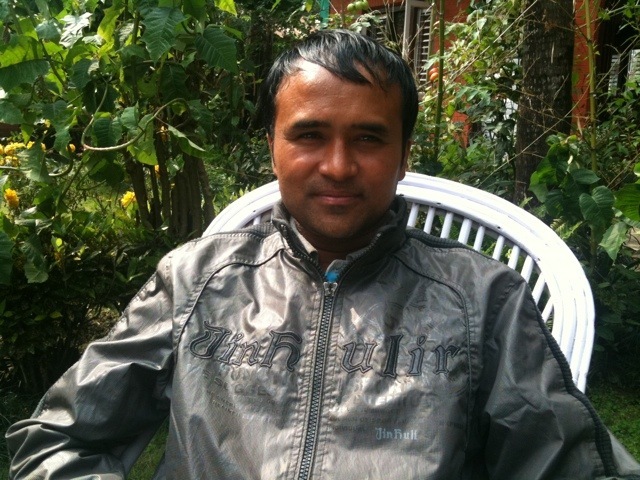 We went with Hum Raj our contact at the hotel who knows everyone in Pokhara and has been giving us good advice during the last few days. Hum Raj used to be a trekking guide and today as I gave him a photocopy of my passport for the trekking permits, he said that he and I are about the same age. Anyway, Hum Raj took us to a shop owned by his friend and after some negotiations we got what we needed and within our budget. This afternoon, Hum Raj introduced us to our Porter. His name is Narayan and he speaks some good English. He has been to Annapurna Base Camp many times; in fact he just came back from there yesterday! On that trek he took a family with a boy of only 4 years old! The boy had to be carried at times but it shows that these things can be done. Narayan has a great smile, a nice way about him and I have a really good feeling about this. We discussed the route with Hum Raj and guess what, we’re going to do it backwards! No, we’re not going to walk backwards and we’re not going to start at the Base Camp and walk down. But we are going to drive to Naya Pul and walk up that way to Ghandruck and Chhomrong and then on the return leg go through Tolka and Dhampus. Have a look on the Annapurna Trek page of this blog and you’ll see what I mean. We decided this because Dhampus to Tolka is a hard climb and it could put us out for the first few days. When in doubt listen to the local knowledge. Tonight we have to pack and decide what we want to take in our one big rucksack and what we will leave in the hotel. That could take a long time! start of the trip proper and hi to Juli-chan! Well, something absorbing and absorbent would seem to fit the bill then. Just hope I can keep the reading up at a sufficient pace! Just so excited to read your stories. I really wish I would be there! Backwards, forwards, sideways, what’s the difference! It’s still going to be an amazing time! Make good use of that raincoat! Yes, the raincoat did get quite a bit of use in the last 14 days.